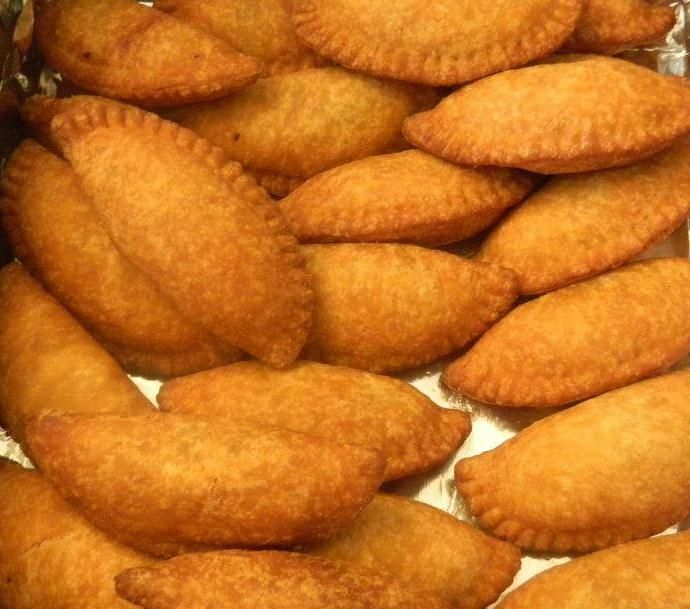 One dish that we share with other cultures is the Empanada. It is a stuffed pastry or bread that is either baked or fried. The stuffing is usually made with meat, vegetables, cheese or fruits, and the dough is folded over it. It is then sealed by folding the edges and pinching it with a fork. The Philippines has different versions of the Empanada, depending on what part of the country it originated. The meat that is usually used is chicken, pork or ground beef. Onions, raisins, carrots and green peas are also added, while potatoes serve as extenders. In the Northern regions, they contain bean sprouts, shredded green papaya, eggs and chorizo (sausage). It also differs in color because the addition of achuete (annatto) gives it an orange color. This Empanada recipe uses chicken for the filling. 1. For the dough, combine all the dry ingredients in a bowl. Add the cold butter cubes in the mixture by rubbing it until it looks like coarse bread crumbs. 2. Gradually add the cold water, and knead until you form a soft and smooth dough ball. Chill in the refrigerator for half an hour. 3. To prepare the filling, heat the oil, and then sauté the garlic and onion. 4. Add the cubed chicken and cook until it turns brown. 5. Add the carrots and potatoes and cook for about 3 minutes. Pour in the water or chicken broth and let it simmer until the carrots and potatoes are tender. 6. Add the raisins and green peas and simmer for another 5 minutes. Season with salt and pepper. 7. Transfer to a bowl and make sure that it is drained of any liquid. Allow to cool for about half an hour. 8. With floured hands, press the dough on a floured surface. Use a rolling pin to flatten to about 1/8” thick, and cut it into 4” circles with a bowl and cookie cutter. 9. Put about 1-2 teaspoons of the filling in the middle of the dough. Fold the dough to make the edges meet and form a half circle. Seal by pressing the edges with a fork. 10. Make the egg wash by mixing the beaten egg white and a little water. Brush the crust with the egg wash.
11. Fry them, three at a time, in a saucepan at medium high. Constantly flip them to avoid burning. Transfer to a plate lined with paper towel to drain excess oil. 12. You can also bake them at 200° C (400° F) for about 20 to 25 minutes or until they turn light brown. 13. Allow to cool off before serving. This video will show you how we made Empanada using a "ready-to-cook" Empanada dough that we bough from the grocery store... its mabilisan! But it tastes really good!